Right from a humble product, the cow’s milk, to more sophisticated product like cheese, dairy is an indispensable part of food and beverage industry. It is quite interesting to note that India is the world’s largest producer of milk and contributes a whopping 9.5 percent to global milk production. The Growth of Clean Label: Years back, people didn’t clearly know what a clean label stood for and now they know what a brand is promising them. They are checking if the dairy products are free from artificial ingredients and chemical/ pesticides. People are willing to a pay good price for the quality that promises adulteration-free dairy products. 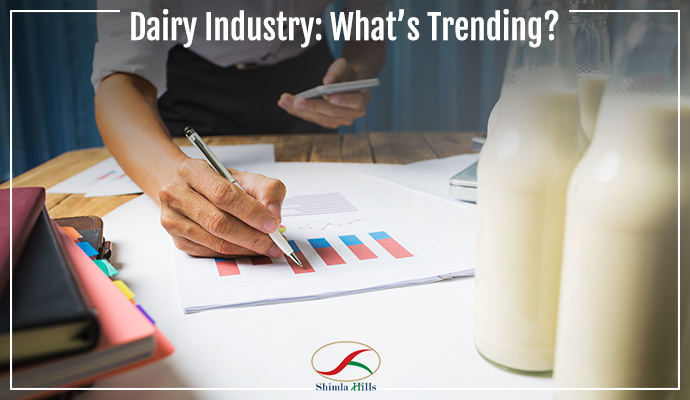 Source of the Dairy Products: People are interested to know where their dairy product is coming from, how they benefit the ground level communities and the locality and conditions in which their product is manufactured. Brands who are able to provide this deeper connection are winners. Hail Health: Consumers are looking for products with the right amount of calcium and probiotics. They are consuming low-fat dairy products to avoid obesity and type 2 diabetes. Markets are brimming with quality products for babies, kids and the elderly that have specific health requirements like low cholesterol, saturated fats, added calcium or magnesium. The Expanding Universe of Dairy with Flavours: As per an international report, about 60% people worldwide are ready to try new flavours. Those who are able to please people with the most unusual flavours, stay ahead in the race. In the same wake, Shimla Hills offers a wide range of quality fruit pulps and F&B industry flavours to enhance the taste and demand of dairy products. One can explore the banana, mango, litchi and more in the pulp category. Its SNIFF arm provides real and authentic flavors for dairy application such milk, yogurt, butter, toppings, ice-cream and desserts. Get your hands on these flavors and pulp NOW!